As we all know, the garden is not only full of wonder and beauty, but it is also contains a world of danger. Stinging insects or poisonous plants that may irritate the skin are present but few realize there are a number of caterpillars that are extremely toxic, leading to hospitalization and possibly death from merely touching them. Those that are dangerous all have fuzzy hair-like spikes or bristles so beware of them. I experienced a severe reaction several weeks ago by picking up a lovely lime green fuzzy caterpillar who had somehow ended up on the wing chair in the den. As I picked it up gently with my thumb and forefinger, I immediately felt a terrible sting on my finger... it was much stronger than a wasp sting. I grabbed a wash rag to move it, tossed it outside, and rushed to wash my hand. Unfortunately, the toxic that had been released through one of the spikes on the caterpillar was already coursing through my finger up my arm into my body… it made me wheeze, itch for over eight hours, and it gave me a nose bleed. 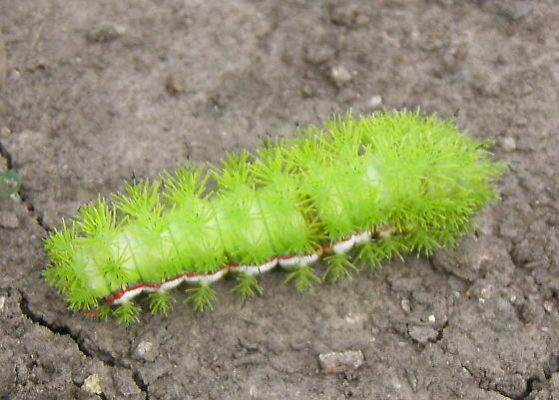 It was a cute Io Moth Caterpillar and I never would have imagined it was poisonous. There is a reason why the Swiss German word for caterpillar (teufelskatz) translates to "devil's cat” for some caterpillars have urticating hairs — hollow bristles that contain toxins from poison-gland cells. When touched, these structures can break and the poison is released. Reactions run the range from mild stinging and itching to intense pain and, in the case of the Giant Silkworm Moth Caterpillar, even death. 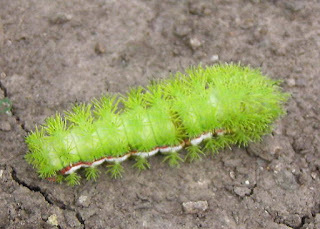 Since caterpillars eat foliage, they famously fall from trees on unsuspecting hikers and gardeners so check your outdoor jackets and hoodies carefully when coming inside. Knowledge is the best protection so I will list the most dangerous below: Use this list to view them under ‘Images’ on the computer. The most poisonous here is the Puss Caterpillar, which resembles a fuzzy brown kitten, thus its name. The venom comes from spines concealed by the fuzzy surface and reaction is immediate… a five year old Texas girl was hospitalized in ICU last week after one fell on her from a tree. Difficulty breathing, throbbing pain and numbness in limbs, stomach and muscle issues may occur from one drop of venom! 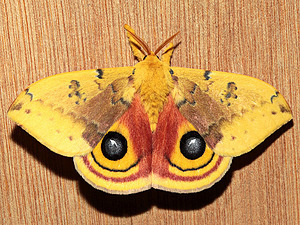 Next is the Io Moth from my experience followed by the Fuzzy White Moth Caterpillar which will produce a dreadful case of hives all over the body… they are voracious feeder and enjoy traveling enmass. The brown Hag Moth has eight pairs of legs which may fall off without harming the larvae, but they produce a fierce and spreading skin reaction when encountered. The Pine Processionary Caterpillar has an interesting fuzzy appearance and the ability to ‘shoot’ its harpoon-like hairs, complete with venom. And most dangerous of all is the Giant Silkworm Moth Caterpillar, known as the Assassin Caterpillar who is responsible for over 500 deaths in South America. After a myriad of progressing painful symptoms, the individual will almost always succumb to hemorrhages on the brain and renal failure. If stung, use scotch tape repeatedly over the area to remove all bristles, apply ice packs to reduce stinging and swelling, and finally apply a paste of baking soda and water. If a history of asthma is present go to the ER as a precaution. We had very unusual weather all summer with occasional cool spells which reminded one of New England. Quite suddenly Fall is upon us ushering in all of the beauty Mother Nature has saved for last. This is the season most favored by many gardeners because of the quietude... for a brief moment in time there is nothing particularly pressing and now is the time to enjoy the migrating butterflies and the multitude of darling dragonflies floating about. Kale is among the oldest of the cultivated edible greens and has been a staple in the garden for centuries. A form of cabbage native to the wilderness of North America as well as all of northern Europe, it added a much welcome green and leafy vegetable to dinner tables and soup pots during the winter. 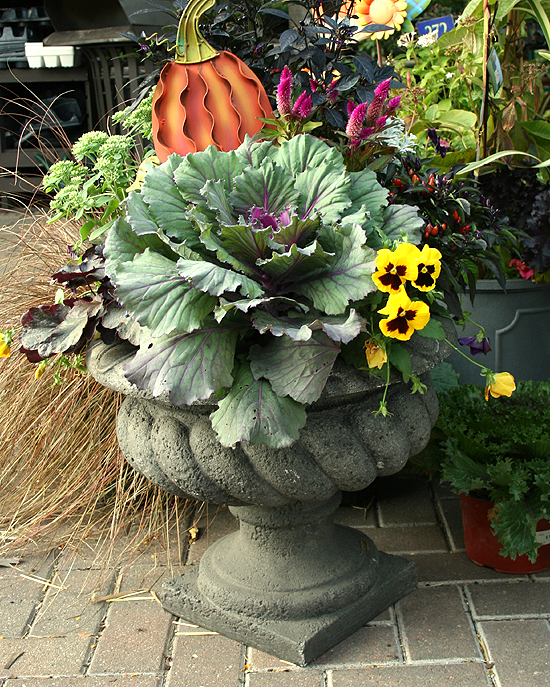 The ornamental Kale is edible but does not form the tight center ball common in cabbage. Exceedingly popular today, it arrives at the nursery sporting a multitude of interesting ruffled leaf combinations, from spires to tight rosettes. Kale is round, dense and slow growing, making it a easy to contain. One of its most impressive attributes is the fact that the colors deepen as the temperature dips, meaning the bright white, vivid greens, purple, burgundy, blues and variegated colors become more lovely as the winter deepens. The precious pansies have begun arriving in the nurseries and it is a wonderful time to plant them. Originally a common viola growing in fields and hedgerows in England they were cultivated by William Richardson, gardener to Lady Mary Elizabeth Bennett in the early 1800’s. Despite his efforts, their first noted appearance was on the estate of James, Lord Gambier. His gardener, William Thompson, began to cross various viola species with a viola tricolor in an effort to achieve a round flower of overlapping petals. In the late 1830s he found by chance a flower that no longer had narrow nectar guides of dark color on the petals but a broad dark blotch instead. From this pansy came the future ‘flowers with a face'; his hybrid was released to the public in 1839 with the name "Medora". This pansy and its progeny, including "Victoria" became wildly popular with gardeners and breeders throughout all of Europe. If planted now, they will survive nicely over the winter and will have a head start in the spring. Such a cheerful, adorable little flower is always a welcome guest at the garden party and the color options are positively stunning, their faces delightful!